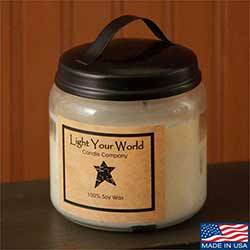 The Weed Patch now carries its own line of 100% Soy Candles! Soy burns cleaner, longer, and is better the environment because soy is a natural, renewable resource, and supports America's farmers. Our soy candles are individually hand-poured, use cotton wicks, and come in votives, tealights, and glass jars (which are reusable!). NO lead wicks, NO dyes, and NO soot or harmful vapors! And the best part is that they smell really REALLY good – every fragrance we have smelled so far has been absolutely delicious! Choose from Cinnamon Stick, Lemon Zest, Pink Grapefruit, Cinnabun, Vanilla, Victorian Christmas, Pumpkin Pie, Spiced Orange, and lots more! 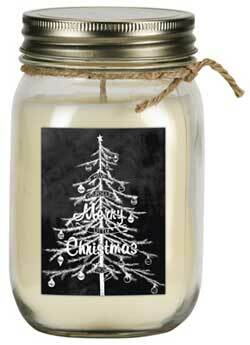 Balsam Fir Soy Mason Jar Candle with Tree, by Primitives by Kathy. This highly fragranced candle is made of soy wax, housed in a mason jar, and features chalk-style artwork on the front. Candle fragrance is a wonderful woodsy pine scent of Balsam Fir. Artwork features a feather tree and says Merry Christmas. Candle is 10 ounces, with approx 45 - 60 hour burn time. 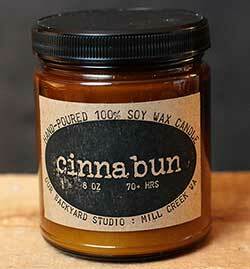 Cinnabun Soy Jar Candle, hand-poured right here in Washington State! Our soy candles are hand-poured using 100% soy wax, with cotton wicks and no dyes; they do not emit soot or harmful vapors. One of our most popular year-round scents, Cinnabun is absolutely bursting with spicy cinnamon, with notes of vanilla, clove, and other spices. Just like you have baking cinnamon buns in the oven! Our jar candles are packaged in vintage-inspired amber glass jars for a classy, antique apothecary look. 8 oz, 70+ hour burn time minimum. 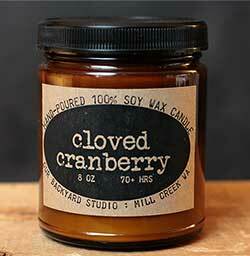 Cloved Cranberry Soy Jar Candle, hand-poured right here in Washington State! Our soy candles are hand-poured using 100% soy wax, with cotton wicks and no dyes; they do not emit soot or harmful vapors. Cloved Cranberry combines the crisp, fruity scent of ripe cranberry with the warmth and spice of cloves, with a sprinkling of sweet sugar. Great year round, but especially nice in the winter! Our jar candles are packaged in vintage-inspired amber glass jars for a classy, antique apothecary look. 8 oz, 70+ hour burn time minimum. 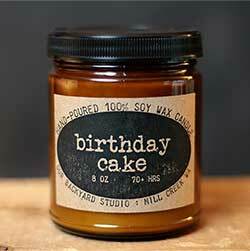 Pumpkin Pie Soy Jar Candle, hand-poured right here in Washington State! Our soy candles are hand-poured using 100% soy wax, with cotton wicks and no dyes; they do not emit soot or harmful vapors. Pumpkin Pie is of our most popular year-round scents, but is hands down, our bestseller for the fall and holiday season! This pumpkin pie fragrance is buttery, butterscotch-y, and very VERY fragrant! Our jar candles are packaged in vintage-inspired amber glass jars for a classy, antique apothecary look. 8 oz, 70+ hour burn time minimum. 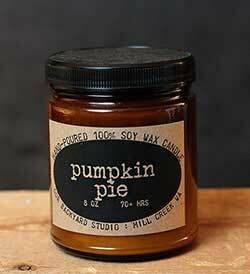 Pumpkin Pie Soy Tealight Candle, hand-poured right here in Washington State! Our soy candles are hand-poured using 100% soy wax, with cotton wicks and no dyes; they do not emit soot or harmful vapors. Pumpkin Pie is of our most popular year-round scents, but is hands down, our bestseller for the fall and holiday season! This pumpkin pie fragrance is buttery, butterscotch-y, and very VERY fragrant! Standard-sized tealight candle in clear plastic candle cup, 6+ hour burn time. Peppermint Soy Mason Jar Candle, by Primitives by Kathy. 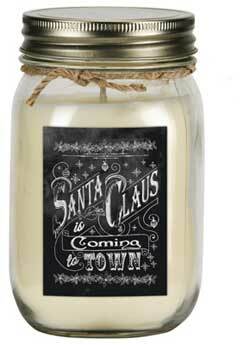 This highly fragranced candle is made of soy wax, housed in a mason jar, and features chalk-style artwork on the front. Vanilla Soy Jar Candle, hand-poured right here in Washington State! Our soy candles are hand-poured using 100% soy wax, with cotton wicks and no dyes; they do not emit soot or harmful vapors. One of our original candle fragrances, Vanilla is a classic fragrance welcoming to most noses. We did a LOT of testing before settling on the perfect vanilla. This one is a Madagascar Vanilla with a hint of butter, chocolate and cream. Our jar candles are packaged in vintage-inspired amber glass jars for a classy, antique apothecary look. 8 oz, 70+ hour burn time minimum.